It’s important to honor all of your client’s inner parts in therapy. But accessing them to fully engage in healing work isn’t always easy, especially when they've been through unimaginable trauma and feel lingering shame, as is especially common with trauma survivors. Lisa Ferentz, LCSW-C, DAPA, is founder of The Ferentz Institute. Her books include Treating Self-Destructive Behaviors in Trauma Survivors: A Clinician’s Guide, Letting Go of Self-Destructive Behaviors, and Finding Your Ruby Slippers: Transformative Life Lessons from the Therapist’s Couch. 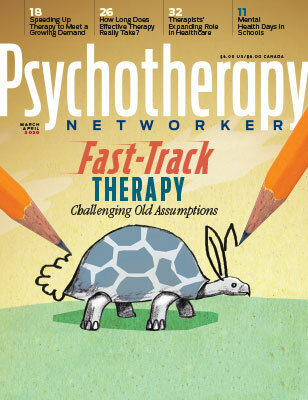 As Lisa mentions in her Networker article, working creatively energizes many of her traumatized clients, "in part because they were already creative, having invented all kinds of strategies for safety and survival." Working with a sexual assault survivor, Melissa, she explains how she used journaling to help her move beyond her pain and even find ways to make meaning from the horror she experienced. I watched a short video from you guys by a guy whose name is Scott, and he was speaking about the importance of dealing not just w symptoms, but with the root cause. He used the metaphor of fruit on an apple tree being the symptom, and instead, dealing t=with "undercurrents" ... the seeds of the apple that are more root causes. Can you tell me where to find this video again?